We love to sit on our front porch, especially as the nights start to get warmer in the Spring. Any given night you will probably find us sitting on our front porch bench while Braylee and Harley play in the yard. It is honestly my favorite part of the day! I really don’t love Winter because of the fact that we don’t get outside nearly as much as we do in the Spring. Typically, when Winter is over we have quite a bit of sprucing up to do in order to get our front porch Spring ready. We don’t spend a lot of time on the front porch during the warmer months which causes it to get pretty dingy looking. 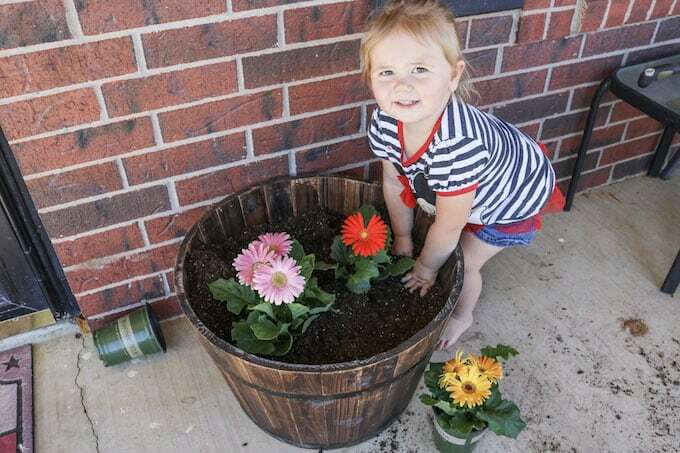 Here is what we do to update our front porch for spring! We either take our power washer or our water hose and just rinse everything down. I actually remove all of the screens on the house and wash those and the outsides of the windows to make them look better. We have a large window on our front porch so this is a must do. I will also spray down the concrete to clean it off. Depending on what kind of furniture your have outdoors you can either spray it with water or clean it with some type of cleaner. I use windex for the glass tables we have and then use the water hose on everything else. We have a bench with a cushion and two tiny tables that go on each end so we don’t have a ton of furniture to clean on the front porch, but it is just enough to make it functional for us to sit out there in the evenings. You can purchase wreaths at a lot of different places. I would recommend Hobby Lobby or even get a homemade one on ETSY! Adding a wreath to your door with bright colors and pretty flowers will help brighten up your porch. If you are a crafty person you can even try making your own! Search Pinterest for “DIY Spring Wreaths” and I am sure you will be able to find a ton of great info to get you started. My favorite beyond favorite part of making the front of our home look beautiful for Spring is adding flowers! 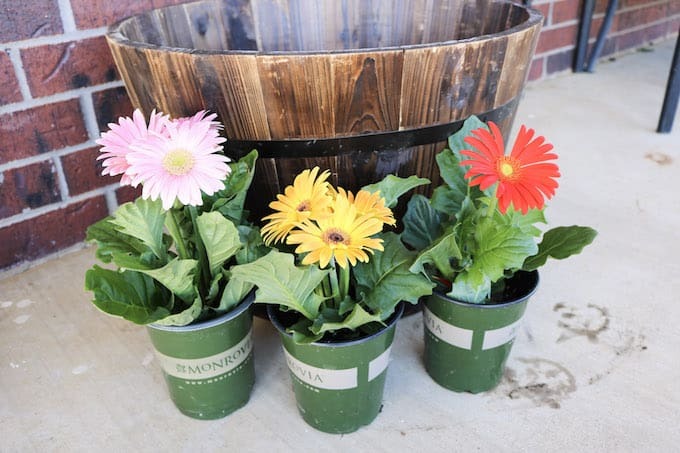 You don’t even need a flower bed to make it happen you can purchase flower pots like we did at Lowes. We do have a flower bed, but we also added an additional barrel to put my favorite flowers in. We bought Monrovia brand flowers because they were beautiful and incredibly well priced. 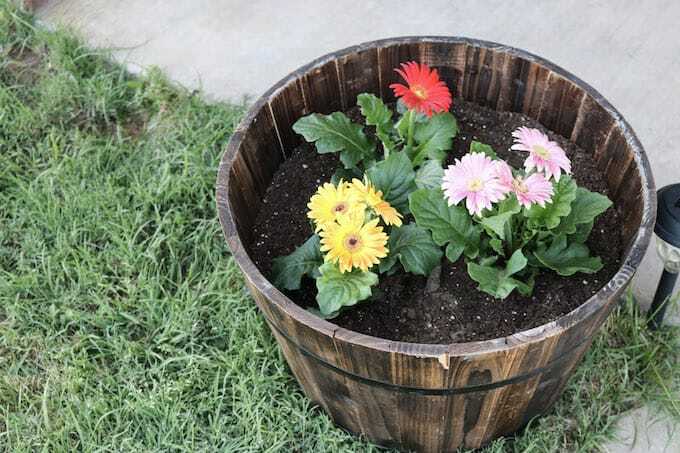 When we buy a large amount of flowers for our flower beds and pots the price can really add up so it was important to us to find them for a decent price. It is also always such a fun thing for us to do together as a family, even little B helps! We all picked out the flowers together, decided where to plant them, and then got to work! 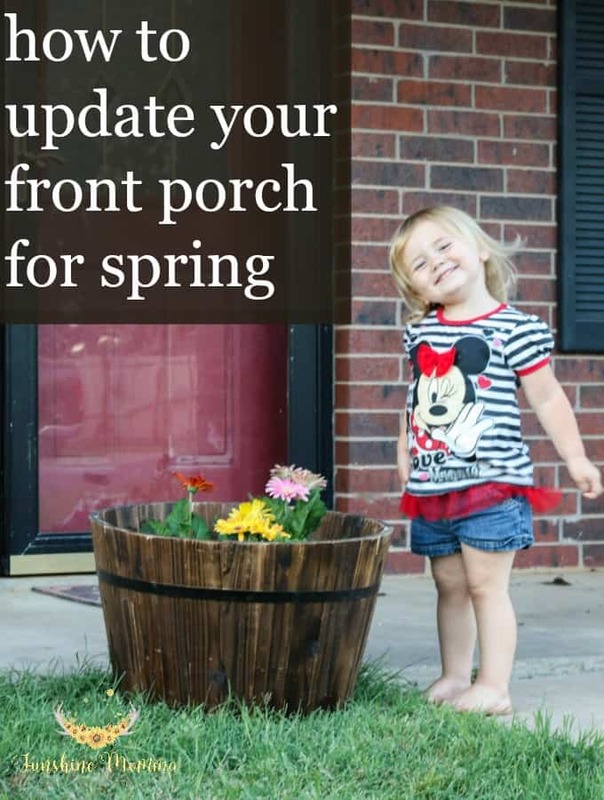 These are the 4 things that we typically do to update our front porch for Spring! Also, be sure to check out this outdoor spring cleaning checklist post!